Do you have family dinners? Do you eat as a family at the table laughing and talking or do eat in front of the tv, distracted barely talking? Do you have time to sit down as a family or do you meet yourselves coming and going most week nights? During Christmas time with all those fancy tear jerker commercials you see families sitting around a huge dinner table with pretty decorations and candles and everyone smiling and laughing...I think they are meant to make you feel all warm and fuzzy inside. 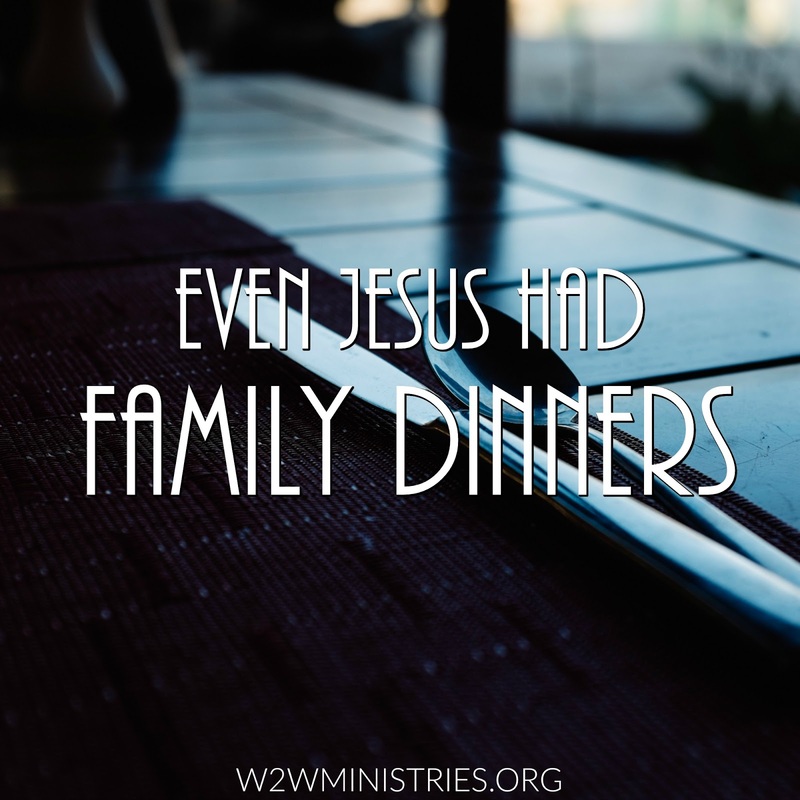 Even Jesus had family dinners...Do you remember when He fed the 5000? He had everyone sit down in groups and then gave thanks to God for the food. Can you imagine how that family dinner looked? What about when He fed the 4000. Again He had everyone sit down in groups, gave thanks and everyone ate and were satisfied. I've heard it's a proven fact that kids who eat with their parents at the dinner table turn out to be more open and honest with their parents as teenagers, I don't know how accurate that is but it sounds good. If you don't have family dinners, would you think about making time at least once a week to eat a meal with your family? Here are some ways to make dinner/lunch/breakfast a peaceful quiet time... turn on some worship music softly, pray before the meal, light some candles, have conversations with your husband and kids, when you ask about their day, be genuinly curious. Invite the kids to cook, or even plan the meal...get the family involved. Everyone says Christmas is so busy, but maybe instead of focusing on how busy you are, focus on the blessing...your family in the midst of the craziness...loves you more than you probably even know. Mandy, I love this!! Jesus even had family dinners, how cool!! Family dinners are very important in our house. We sit at the dining table every single night and have dinner together. I always have classical or just instrumental music playing and candles lit. Just because that is what I like for calm anyway and normally start the music and light the candles mid-afternoon, so I love that suggestion. It really does help a create a peaceful atmosphere for dinner. Such great encouragement today Mandy! Thank you! AMEN! Family dinners are so important. It's so easy to just put up the tv trays and eat while watching tv. But that is so impersonal! As a child...we always had family dinners at the table. When my kids were little...same thing. As they got older and our schedules changed, it got to be eating in the car on the way to church or where ever. I hated that. A couple of my kids now...they don't do the family dinner table on a regular basis and it breaks my heart because I know how important they are. I'll just keep praying that they see the importance and make the appropriate changes.